This bundle includes three different products. 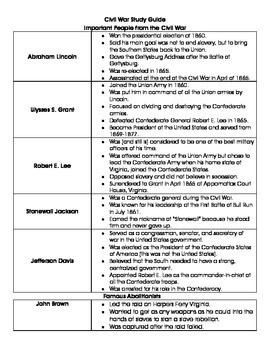 Civil War Study Guide: The study guide provides students with information about important people, important events, causes of the Civil War, and major battles. It can be given to students at the beginning of a unit or before a test. 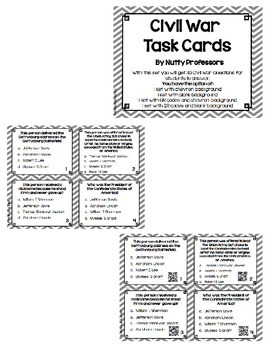 Civil War Task Cards: You will receive thirty different task card that have questions about the United States Civil War. In this set you be able to choose between a chevron or plain background and cards with or without QR codes. 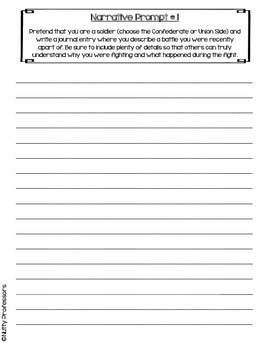 Civil War Writing Prompts: You will receive five informational, narrative, and persuasive writing prompts that revolve around the Civil War.